Avocado Productions was started 30 years ago in Oswego, Illinois as a small production company. Over the years our motivation has always been to provide affordable, high quality audio services without compromising service to our clients. Our focus was and continues to be guided by our clients. It was not long before we'd out-grown our modest recording studio. And in 2003 we moved to our current location in beautiful Colorado where we opened our Zephyr Room studio. 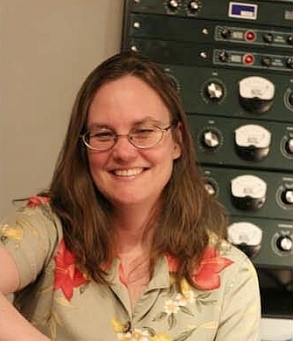 After attending classes taught by legendary Chess engineer Malcolm Chisholm at Columbia College Chicago, Angie started her recording career in 1984 at Pierce Arrow Recorders in Evanston, Illinois. Soon after, she started Avocado Productions, moving the company to Colorado in 2002. Angie is a member of a number of recording and archiving organizations and was recently named among the best engineers in Denver by Westword. Check out her profile on SoundBetter. Many have asked about the origin of our name. Our company was actually named after this ad campaign. In 1986, owner Angie Dickinson needed a name for her new audio production company. All suggestions related to the fact that Angie shared her name with the actress Angie Dickinson (star of the TV series "Policewoman", countless movies and, a few years earlier, was seen in print ads for the California Avocado Commission). Avocado Productions (which sounded better than Policewoman Productions) became the company's name in the star's honor. A big Thank You to everyone who helped in the search for this ad! ©1997-2019 Avocado Productions, Broomfield, CO. All rights reserved.